After the immense success of Tendon Kohaku, they took over the space next door originally occupied by Tonkatsu Agedoki and started Katsudon Hanakatsu. Hanakatsu is also part of EAt@7 at Suntec City. Here’s a breakdown on the shop name. Katsu, the short form for “katsuretsu,” means deep-fried cutlet whose meat are pounded or filleted thin. A major difference between tempura and katsu is that tempura is dipped in a batter but katsu is coated in bread crumbs. “Don” is short for donburi, meaning ricebowl. Together, “katsu-don” means fried cutlet on rice. “Hana” refers to flowers. 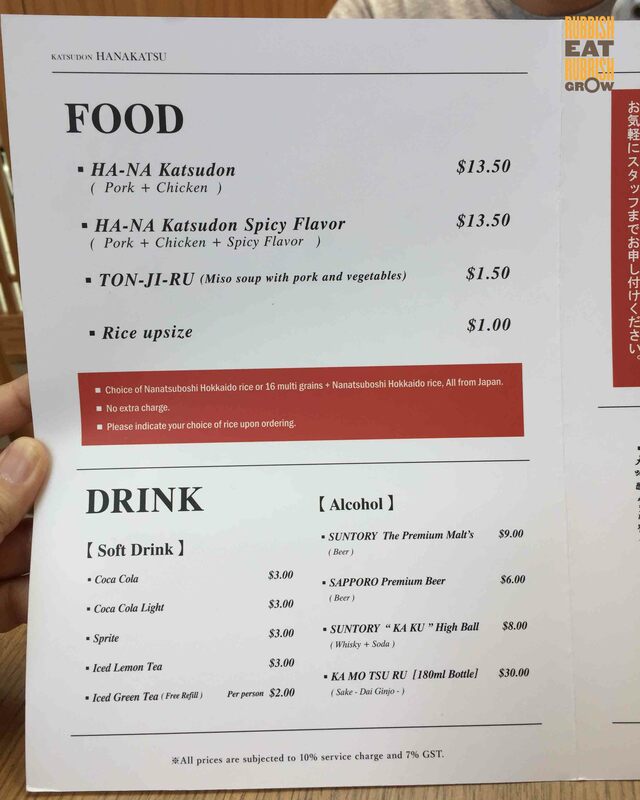 So the shop name “hanakatsu” is transliterated to flower-cutlet. Hence, the food here is arranged like flowers. Get it??? There are only 2 options on the menu, original or spicy, both priced at $13.50. Both come with 6 pieces of chicken and pork. For the rice, there is an option of Nanatsuboshi Hokkaido Rice or 16 Multigrain Rice. Nanatsuboshi Hokkaido Rice has received Toku-A, the highest possible rating in taste tests by the Japan Grain Inspection Association. It is known for their nacreous glow, stickiness, and an excellent balance of sweetness, suitable for sushi. Because Hokkaido is cold, farmers can use less agricultural chemicals for keeping off pests. Each katsudon comes with an empty plate because the toppings are just too huge and you have to remove some before you can eat or it will fall off the bowl. Both the chicken and pork cutlets are fantastic: tender and crispy but not greasy. As for original or spicy, both are very delicious. There is some kick to the spicy rendition which is also sweet and addiction, but Mr Fitness and I prefer the original and enjoy the taste of the meat without any unnecessary embellishments. Unlike katsudon elsewhere which usually comes with an eggy sauce, the sauce here, drizzled on the rice to keep the katsu crunchy, is more refined but equally addictive. The sauce itself is umami as it softens the rice. The food is really quite something, but one area for improvement: the decor. It inherited the decor from the defunct Tonkatsu Agedoki, and didn’t do anything. When we were there in the afternoon, the sun fell on us and the heat was unbearable even in an air conditioned place. This, of course, could easily be solved by hanging cloth over the bare wooden beams. Unlike their sister outlet Tendon Kohaku which retains its popularity even after one year of opening, there was no queue at Hanakatsu. This befuddles us because Hanakatsu is just as excellent as and more affordable than Kohaku. We spent $31.78 for two persons. It’s a place I’d gladly come even if I have to suffer the wrath of the sun again. –Tendon Ginza Itsuki, Tanjong Pagar: Well Worth the 30-Min Queue for Tempura Donburi!